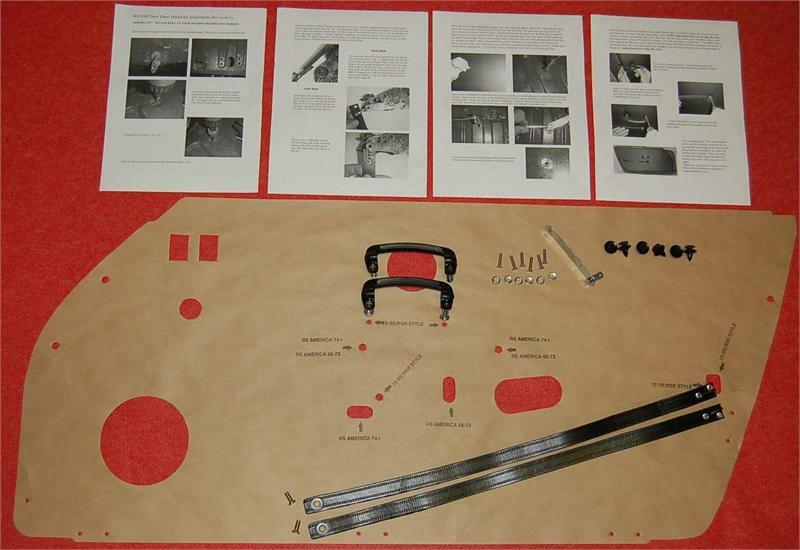 This kit does not include the actual panels, it contains a precision die cut templae, that you use to replicate the panels used on the Legndary 1973 RS/RSR models. They will fit all 911, 912, 912e, 930, SC, Carrera 3.2, 964 (C2/C4), and 993 models. These panels will not fit 996 models. We supply you with a die cut template for use in making your own panels from wood, metal or plastic. This set includes the template, the wimpy plastic handels (same ones that the factory used), Long embossed leather opener strap, Handle anchor kit with setting tool (we anchor our handle to the door, not the door panel like others), (6) plastic panel panel retainers, screws and trim rings and complete instructions.